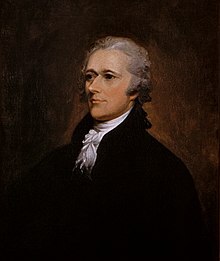 Ba theoiricí polaitiúil agus státaire Meiriceánach é Alexander Hamilton (11 Eanáir 1755 [a cheaptar] – 11 Iúil 1804). Rugadh Hamilton ar oileán Nimheas, coilíneacht Bhriotanach i Muir Chairib. Chuaigh sé san arm Meiriceánach nuair a bhris an Cogadh Réabhlóideach amach. Tháinig sé ar an tuairim go mbeadh rialtas lárnach láidir de dhíth ar an phoblacht nua. Bhí Hamilton ar na húdair a scríobh na Páipéir Fheidearálacha, a chabhraigh go mór le cúis an bhunreachta nua a bhaint amach. Faoin Uachtarán George Washington, rinneadh an chéad rúnaí ar státchiste Mheiriceá de. Bhí tionchar mór ag Hamilton ar fhorbairt an náisiúin nua ach chuaigh sé i gcoimhlint le Thomas Jefferson, a bhí go láidir ar son cearta na stát aonar, agus ansin le hAaron Burr, polaiteoir uaillmhianach as Nua-Eabhrac. Fuair Hamilton bás i ndiaidh a bheith gortaithe i gcomhrac aonair le Burr. Tugadh an leathanach seo cothrom le dáta an 30 Meán Fómhair 2017 ag 06:11.